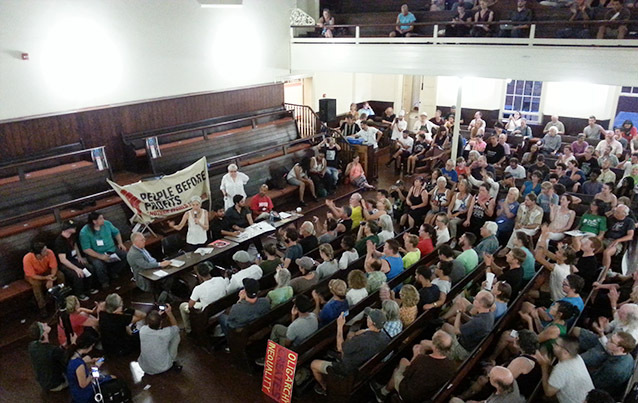 On the steamy evening of July 27 in Philadelphia a raucous audience of close to 800 gathered to discuss electoral politics and movement-building. This was day three of Socialist Convergence, organized by a coalition of left organizations to create a socialist presence during the Democratic National Convention. Our target participants were the Sanders delegates and supporters who had promised to challenge the party’s lack of democracy and to organize protests in and around the convention that would serve notice on the party establishment. An early core of organizers quickly expanded to include representatives from many groups and organizations who worked together extremely well as we negotiated the rocky road of planning a very ambitious undertaking: Solidarity, Philly Socialists, Philly Chapter of Democratic Socialists of America, Green Party of NY State, International Socialist Organization, Kentucky Workers League, Left Elect, Party for Socialism and Liberation, and Socialist Alternative. Members of Philly DSA, Philly Socialists, and Solidarity provided crucial infrastructure to the project. Having secured the Friends Center for every evening of the DNC, organizers set about developing a program intended to offer a range of socialist politics on pressing topics including the capitalist economy, racism/white supremacy, environmental crisis, elections and independent politics, and intersectional feminism. From Saturday through Thursday, organizers fanned out across Philadelphia to distribute cards about the Socialist Convergence at every gathering, rally, march, and protest–and there were plenty of them! In addition to giving away at least 3,000 cards advertising the event, we made an effort to engage people in conversation about socialism. It was encouraging to observe how many expressed support and interest, whether or not they planned to attend. 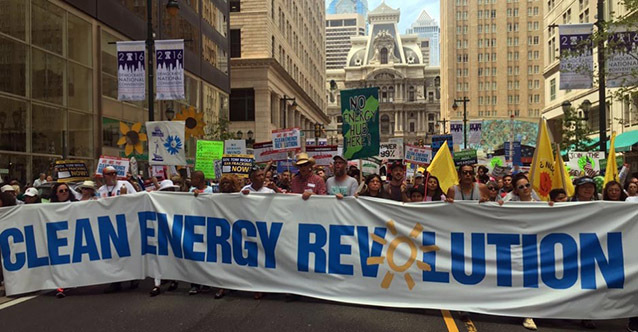 The March for a Clean Energy Revolution was led by Indigenous people and front-line communities, and turned out upwards of 10,000 people. The best organized and largest protest was the March for a Clean Energy Revolution on Sunday where upwards of 10,000, led by Indigenous people and front-line communities, turned out to demonstrate against fossil fuels and against the TPP and other global agreements because they undermine environmental regulation. A spirited, but smaller, march on Tuesday afternoon was organized by the Philadelphia Coalition for REAL Justice which started in the area around Temple University, where community members are fighting gentrification and a new stadium. A bilingual rally and march featured Laura Zuniga Cáceres, the daughter of Berta Cáceres who was recently assassinated in Honduras. Zuniga Cáceres also spoke briefly and movingly at the Socialist Convergence. Various events were organized by the People’s Human Rights Campaign, by Global Women’s Strike for Peace, Black Men for Bernie, Jill Stein campaign, and Grassroots Global Justice, among others. The Socialist Convergence intended to address these various movements and campaigns from a socialist perspective. Titling our program “Carrying Forward the Political Revolution,” we hoped to center strategic questions, not least of which is how to build coalitions and mutual support across this wide range of issues. Over the four nights there were many thoughtful presentations; but not all of the panels sparked the sort of dialogue about strategic possibilities that organizers had hoped for. The panel on electoral politics, with well-known speakers including Chris Hedges and Jill Stein, drew the largest and most boisterous crowd. It had been organized to discuss “what next” after Sanders’ defeat and the coming installation of Hillary Clinton. A good part of the audience came to cheer on and support the Jill Stein campaign. Stein obliged with a repeat of her stump speech, claiming (rather amazingly) that if all 43 million people burdened by student debt were to vote for her, she could easily win the presidential election. The Wednesday night panel of the Socialist Convergence featured Jill Stein, Chris Hedges, Bhaskar Sunkara, Steve Williams, and Lev Hirschhorn. Throughout the four evenings the presentations led to lively sessions of questions and comments. On separate panels, Glenn Ford of Black Agenda Report and Tony Monteiro from Black Radical Organizing Collective and Philly Coalition for REAL Justice challenged the audience to think about the link between white supremacy and the rise of fascism through the Democrats’ complicity in mass incarceration, militarized police, and the expansion of the national security state. Gayle McLaughlin, from Richmond Progressive Alliance in Richmond, CA, made the case for the importance of local independent political action as building blocks toward challenging the two-party system and offered lessons from the Richmond experience. Howie Hawkins, New York Green Party activist and candidate, reminded us about the role of socialists in building successful third parties in the U.S. in the late 19th and early 20th century. Other candidates speaking about their experience in electoral politics were Gloria Mattera and Margaret Flowers from the Green Party, Kshama Sawant from Socialist Alternative, and Eugene Puryear, from the Party for Socialism and Liberation. Although not quite what we planned, the Socialist Convergence did provide a space for activists excluded by the corporatist politics of the Democratic Party to express their anger, their hopes, their defiant support for third-party efforts and their solidarity with the many movements represented in the program. Perhaps the most positive outcome of the Convergence were the respectful relationships built among the organizers. At our evaluation meeting, everyone expressed a desire to continue working together, particularly in local projects or regionally. From the perspective of Solidarity’s commitment to building a “next left,” the Socialist Convergence was a real success. Johanna Brenner is a socialist activist in Portland, OR and a member of Solidarity’s National Committee. She is Professor Emeritus of Women’s Studies and Sociology at Portland State University. I recognize and applaud the comradely and generous movement-building efforts that Solidarity put into the Socialist Convergence meetings in Philadelphia along with Philly Socialists & DSA. I must ask however, did Solidarity have no speakers on any of the panels? The long coherent and principled history of Solidarity and its Legacy precedents have contributed in producing an important body of thoughtful political development and discourse in the pages of “Against the Current” and online, not to mention the honorable grinding work of building revolutionary cadre and organization out of the shards of often tragically failed and flawed but politically important predacessors. I would think therefore that Solidarity would have earned not just the honor of organizing the prep work and infrastructure of the Convergence but also qualified for a speaker or two to present its well-thought-through political perspectives. Maybe an unusual-for-the-Left modesty prevented the recounting of more details of Solidarity’s input and influence on the discussions in Philly. But if so, I’d really like to hear more. As an original Labor for Bernie-ite, and former national union President (AFTRA, AFL-CIO), I’m off this evening to attend the inaugural meeting of “Our Revolution” here in LA (there will be some 2,600 meetings nationwide, and a Bernie Telecast); I’ll argue (if permitted to do so) for OurRev to break from the smothering grasp of the Democratic Party, and join the attempt to forge an independent party of Working People. I very much appreciate the reports on the Socialist Convergence meetings (and offer my congratulations), and the valuable array of articles and voices in the latest “Against the Current”.